To country music icon Martina McBride, cooking and singing aren't all that different. When she makes something delicious, she wants to share it, which is a lot like sharing her music with an audience. 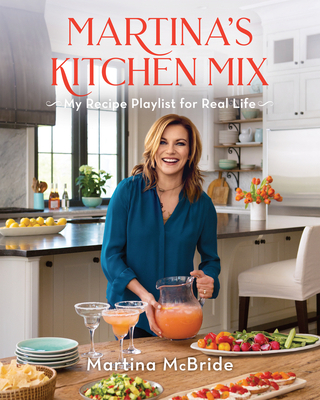 When she's not on stage or in the studio, Martina is most likely experimenting in the kitchen and cooking with family and friends. Growing up on a farm in Kansas, Martina began helping her mother in the kitchen at an early age, preparing fresh-from-the-field ingredients. Meals and stories were shared daily around the table. It's a tradition she continues with her own family as often as she can because real life is what's worth celebrating. In this gorgeously photographed cookbook, readers will find more than 100 simple and satisfying recipes filled with fresh, seasonal ingredients and downhome flavor. Martina encourages cooking "outside the lines" and shows you how to make cooking fun with creative "ad-lib" tips for recipe riffs you might consider. Mix things up in the kitchen and create your own delicious memories with her inspired recipes to feed a handful or a houseful. Whip up Martina's family favorites like her mother-in-law Flavia's Deviled Eggs, husband John's Bacon-Wrapped Olives, or her go-to Grilled Shrimp Tacos with Chipotle Sauce and Slaw. Plan a weekend brunch menu, serving Baked French Toast with Pecan Crumble and Blackberry-Maple Syrup and Hashbrown Breakfast Casserole with Tomato Gravy. Toast friends at happy hour with her Blackberry-Lemon Gin & Tonic while enjoying Grilled Sweet Peppers with Goat Cheese and Herbs. And when it's time to celebrate with family and indulge in dessert, try Martina's Fresh Apple Cake with Homemade Caramel Sauce or No-Bake Peanut Butter-Chocolate Cookies. Martina McBride is a Kansas native and country music icon who made her debut on the charts in 1992. She has earned a string of hits across 13 albums, and has sold over 14 million albums. She is the author of Around the Table: Recipes and Inspiration for Gatherings Throughout the Year. She lives in Nashville, Tennessee, with her husband and three daughters.